Would help to know where you are located in getting a response as shipping one of these is pretty much cost prohibitive. Guy across the street from me has a nice '73 Laguna nose. 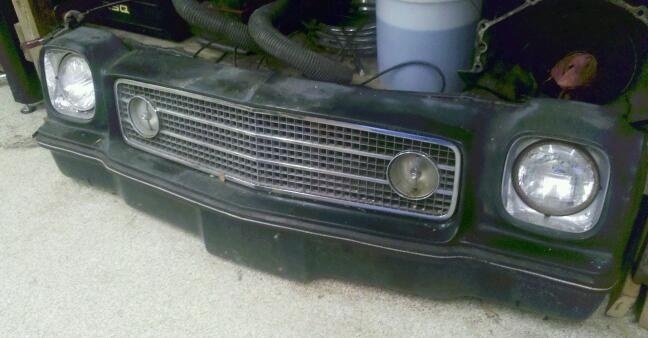 He also has a basket case '77 elcamino, he wants to sell the car.....I asked he won't sell the nose separately. Iirc he wants $4500.00. He claims the price is because the motors rebuilt, and he has lots of spare parts. He is a car / parts hoarder. He has 3 first gen montes, the '77 elcamino, two '53 f-100's, all of them except one of the montes are project cars and he doesn't work on any of them. I am surprised he is looking to sell the elcamino. (He claims it was his high school ride). It was aggravating to me since for years I wanted a Laguna nose & there is one 100 feet from my house that I know he will never do anything with but he won't sell it. Damn.. well still need one. But ugh people.but ya I can travel a little to get one. I got one. its in decent shape. headlight buckets have some rot, will need repair. Shipping one of these is big money. Let me know if you're interested. Yea I am where u located and how much? nice. I want one. Will get one someday hopefully.